A stout engine requires a stout piston and rod combo. When it comes to rods there are a number of choices to be made as to length, material and design. 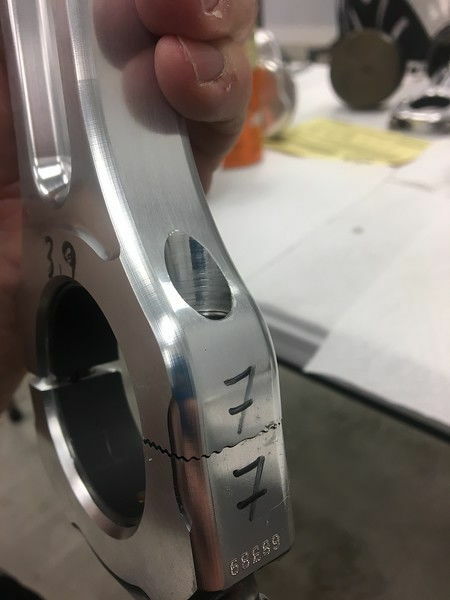 Of course you have design limitations as to the length of the connecting rod because the block is only so big and the stroke is going to factor into just how much room is going to be between the deck height and the crankshaft. With a higher boost engine that is going to produce a lot of cylinder pressure and heat your first concern should be a strong piston which will mean a taller compression height (distance between the crown of the piston and center line of the piston pin). Factor in the stroke, and you will find roughly what your choices are going to be. For std. deck height LS engines rod lengths generally run between 6.036" and 6.125". When dealing with tall deck engines and big stroke crankshafts you might find that the crankshaft company will "cam" the crank for a specific rod or even ask you what you would like it setup for to get the counter weights as close as possible to the correct size and weight. The next is going to be material. The most common is going to be cast, powdered metal, forged, titanium, or aluminum. Cast rods are almost no longer found in OEM engine designs as they have moved towards the powdered metal versions for strength and a low cost to manufacturer with close tolerances. Most LS and LT engines will come standard with a powdered metal rod that can withstand a good amount of power with no modifications. Titanium has also become a more common stream material even for the OE today. That being said do not confuse the almost powder metal Titanium OE style rods to a high quality race piece. 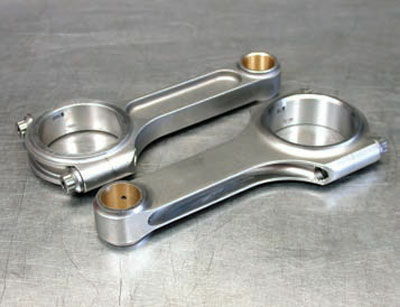 Forged steel rods are still the most common place when it comes to performance upgraded connecting rods. Because so many do make a forged rod, price vs performance on these make them the top choice for almost everyone. Lastly is aluminum rods. Generally speaking these are used for drag racing almost exclusively because of the material will fatigue over time and fail much sooner than a steel rod, and you must account for material growth and shrinking which causes higher than normal bearing clearances. The other issue, is fitting them in the engine. The sheer size of an aluminum rod can pose a lot of issues for the engine builder clearing the block, sleeves, and even camshaft. Below you can see a size comparison between the different materials. Design is another thing to think about. Most have seen, read, or even purchased an I beam, or H beam forged rod set. You will see debates going back for decades it seems on which is going to be right or better for any one build. From what we have seen, the H beam keeps the big end of the rod a little more stable and shows better bearing wear. Again, clearances inside the engine may force you to one design or the other. Modern metallurgy and designs have made both rods stronger than what most street / weekend racers would ever need. Now for our build, we are going to be using aluminum because it is light, strong, and less expensive for an engine that is torn down very often, replacing them is not of a concern. This actually maybe one of the lowest cost items in this particular build, at least the first purchase as these can be found for $1000 or less a set, but remember they will need to be replaced. Here you can see the main components used. 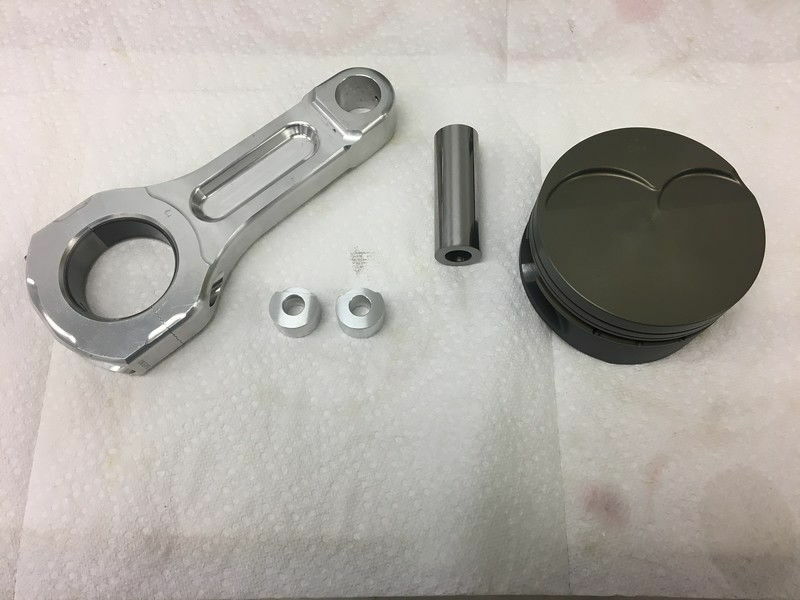 Aluminum GRP connecting rods, tool steel Wiseco piston pins, hard anodized Wiseco Pistons, and the aluminum pin buttons (more on those later). Because aluminum does move around so much with heat and load, you will notice a number of differences when using aluminum rods in your engine. One of the biggest is how the cap is held in place. They will use a large bolt typically, and also the two pieces are split with an interlocking design to keep deflection at a bare minimum. Another part that changes here, is that the bearings must be held in place with dowels. 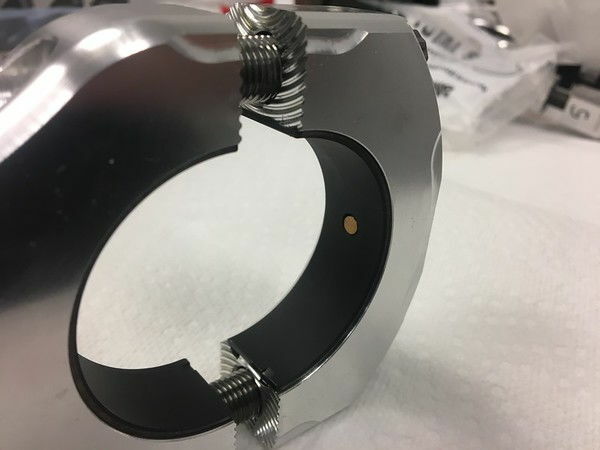 Again due to material growth, sometimes bearing crush can be an issue so small dowels are placed in the rods, with mating holes in the bearing to keep them from spinning in the housing bores. Here you can see better of the interlocking design of the cap as well as the bearing dowel. 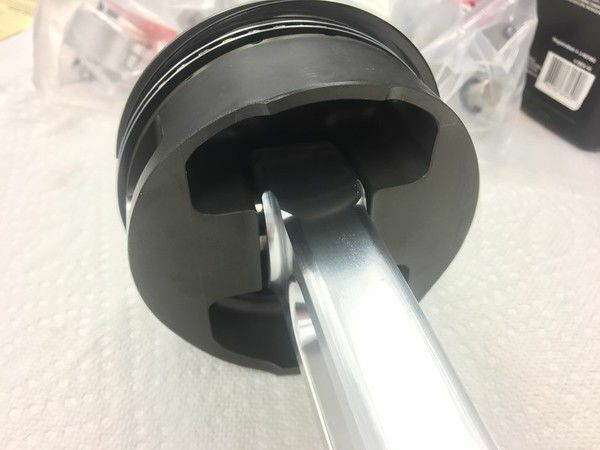 You will also notice that the small end is much bigger than most, again to cut down on deflection during use and provide more support to the piston pin. You may have noticed that these are of a slight I beam design, which most billet aluminum rods are going to be, as they only remove material from which it would do the least amount of reduction in strength but most in weight reduction. Some with a keen eye may have also noticed that there is no bushing in the top of the rod as there would be in a Ti or steel rod. Due to the short life cycle, large clearances, and oiling system used there is no need to have a bronze bushing inserted into the small end of the rods. Again, like the rods you are going to have a few choices on pistons: Cast, hypereutectic (which is still typically cast), and forged. 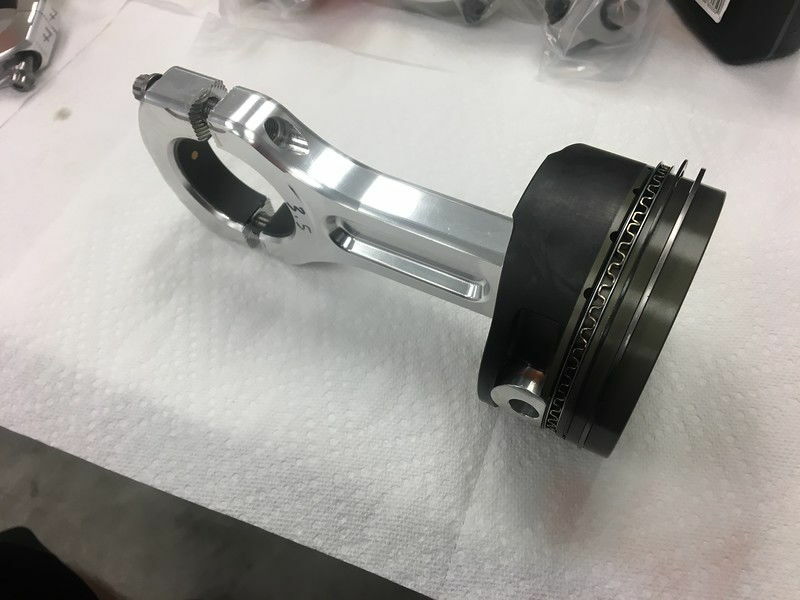 Again most modern performance cars will almost never use a normal cast aluminum piston anymore and have switched to the hypereutectic design for strength, ease to manufacturer, emissions, and low NVH ( Noise, vibration, and harshness). The Hypereutectic piston contains more silicon than just a normal aluminum alloy casting allowing the builder to spec a tighter piston to wall clearance due to the lower amount of thermal expansion. 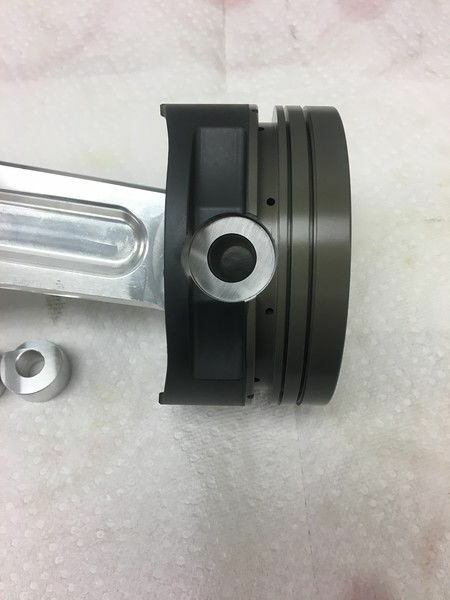 The one down side to adding the high amounts of silicone is that it will ultimately make the piston more brittle leading to failure in high pressure / high HP uses at the slightest amount of detonation. Almost all OE versions of these pistons are going to be cast, but in a few rare cases they can be produced as a forging as well. When building a high performance engine, forging is generally the most accepted way to increase strength of the component. Forged pistons are no different, and you will find a couple different kinds on the market today. Most performance forged pistons are going to be 4032 and 2618 alloys. 4032 forged pistons are what you would typically find in your budget kits, or lower cost alternatives. These are much stronger than a cast and in many ways operate like a hypereutectic piston in that they can be ran at a tight piston to bore so noise is decreased but at the same point they can be brittle when pushed hard and suffer similar effects under extreme stresses. For NA engines, or low HP offerings these are typically fine and a step up from cast. 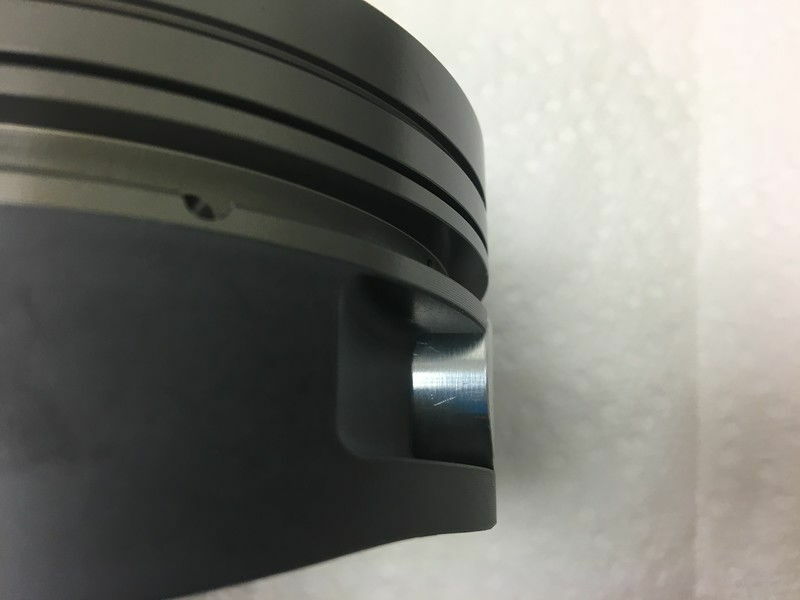 2618 forged alloy pistons will offer a much more ductile material that will deform more so than fall apart under high loads and stress. 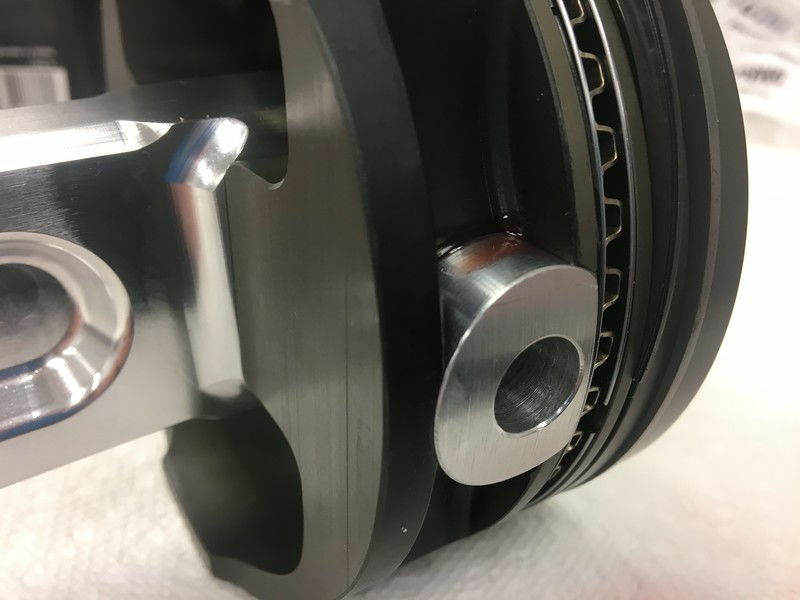 They can show increased wear over what a hypereutectic or 4032 piston would show in 100k+ miles but advancements in coatings, ring design, and skirt design have proven this almost a non-issue in a modern performance engine build. Anodized ring lands, coated skirts, electrolysis nickel and other coatings can make these pistons last for years even in daily use. You will find many piston companies today like Wiseco, CP, Diamond, and others only offer 2618 in their performance pistons and either not use a 4032 or leave it to the stock replacement pieces only. 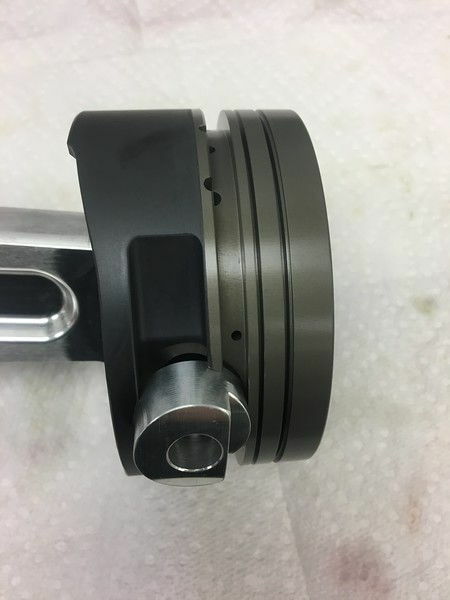 In this build we are of course going to be using a 2618 forged piston from Wiseco and for the heat they will be hard anodized to add even more strength to the piston itself. 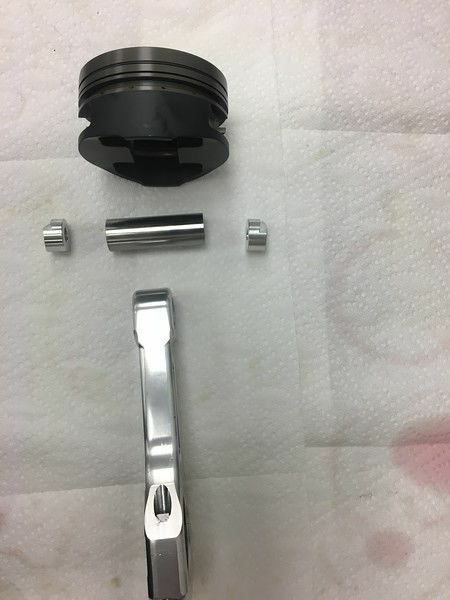 As you might have already noticed from some of the pictures above, this is also a full round piston, meaning the skirt goes completely around the piston for added strength. One thing that might strike some of you as odd...how the assembly goes together. In most cases the piston pins are either pressed into the assembly or held in with some sort of spiral or wire lock as in a full floating design. Because of the pressure, the heat, and the sheer fact that the engine will need to go through a number of tear downs the only thing holding the pin in place are two small aluminum buttons that sit to either side. These are held in place by the oil support rail and do nothing more than keep the pin centered and away from the bore walls. You can also see just how large the BBC sized tool steel pin is in these pictures as well. We could go on for pages about the metallurgy with the different pistons and how that effects each dynamic and what coatings are offered for different uses and aspects of racing. 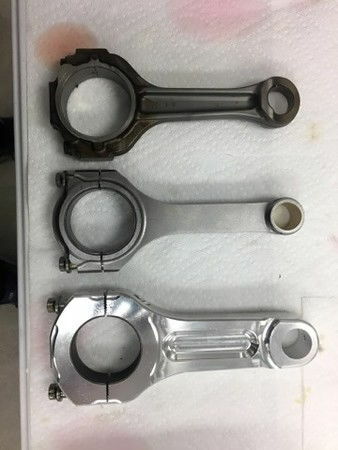 The same goes with the connecting rods as well. Which you can see puts a lot of choices on your plate when building an engine. Your engine builder should know which is right for your use, power, and budget. Most will find a quality 2618 forged piston, and H beam rod to be sufficient for most builds out there.